2018 marks the 45th anniversary of a remarkable example of what people can do when they join together to make a difference. In August of 1973, after a statewide campaign rallying the support of people across Michigan, MNA prevented Michigan’s largest remaining stand of old growth white pine forest from being destroyed forever. Because people across the state helped MNA purchase the land, nearly half-a-century later you can visit MNA’s Estivant Pines Nature Sanctuary, walk its trails, and experience first-hand a majestic virgin forest that has been undisturbed for hundreds of years. This year, MNA received a special challenge in honor of the 45th anniversary of the campaign to save Estivant Pines from logging. 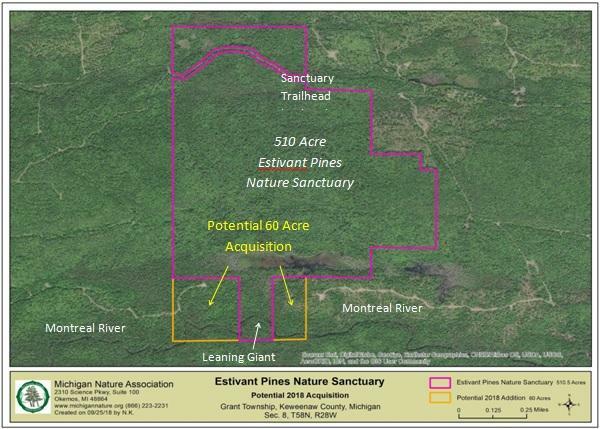 The grant will provide the $90,000 we need to purchase 60 acres along the southern border of Estivant Pines, but only if we show strong statewide support by raising an additional $90,000 for general stewardship. We need 45 individuals to give $100 between now and midnight Tuesday, November 27. As an added incentive, your $100 gift will be matched dollar-for-dollar. Donate to help save the Pines! The majestic white pines at Estivant were once slated for logging and would have been lost were it not for MNA’s members, donors and volunteers who answered the call of concerned locals to save this Michigan natural treasure. No single project has introduced more people across Michigan (and the nation) to the work of MNA and the importance of protecting Michigan’s natural heritage than Estivant Pines. And there is no more inspiring example of what MNA can accomplish when we all pull together than the successful effort to protect Estivant Pines. So much more than the white pines were saved! 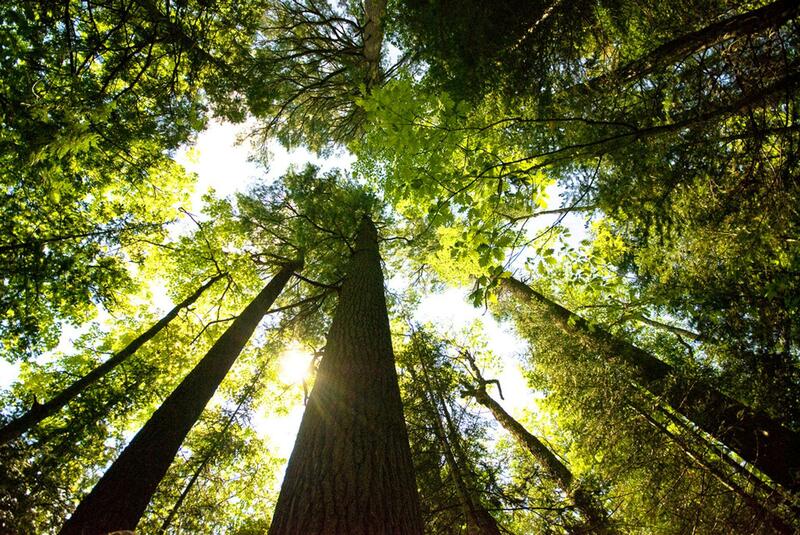 The dense, old growth forest canopy provides habitat for 85 species of birds, including 15 species of warblers. Many other animal species that prefer a mature forest habitat utilize these unique woods, including the pine marten. The pine marten was nearly eliminated from Michigan’s northern forests in the early 20th century. Below the towering trunks of the pines live an astonishing array of wildflowers, such as asters, baneberry, pyrolas and twinflower. More than a dozen species of orchids and over 23 species of ferns, including spleenwort, maidenhair and holly fern, are also scattered across the forest floor. The additional 60 acres comes in two tracts, one on either side of the old growth white pine forest where the Leaning Giant was found years ago. 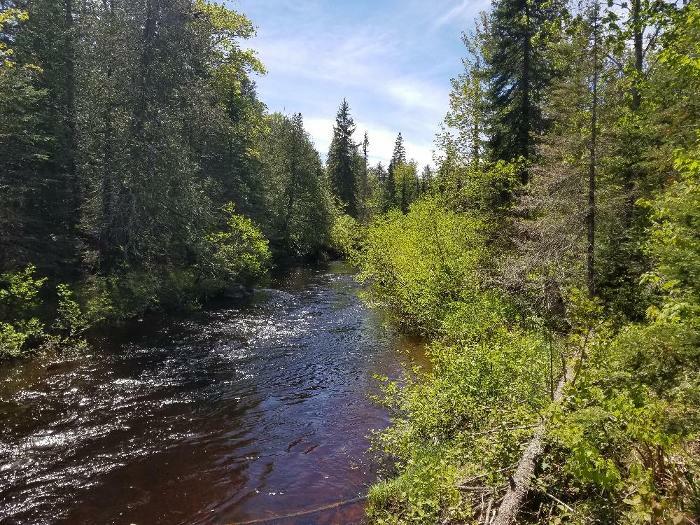 Many of the more adventurous visitors to Estivant Pines Nature Sanctuary take a rough and rugged hiking trail and cross the Montreal River to see the famous Leaning Giant, a celebrated white pine with a trunk eight feet in diameter. Named a Michigan champion white pine in 1971, the Leaning Giant was later brought down in 1987 by a fierce north wind but you can still see its massive trunk lying across the forest floor today. With your support, we can meet this ambitious challenge and acquire this remarkable property. Along with old growth white pines, the 60 acre property contains large cedar and eastern hemlock trees and would serve as an important buffer to the heart of Estivant Pines. Wetlands found on the property are integral to the hydrology of an emergent wetland on the existing sanctuary that is regularly used by American bittern, a species of special concern in Michigan. Acquiring the 60 acres would also ensure the protection of a half mile of the Montreal River with frontage on both sides.